PrintBITS July 2013 - Printing Concepts, Inc. Tubes, boxes, lumpy envelopes, die-cut things, and odd-shaped mailers are the kinds of packages that pique curiosity and beg to be opened. Would your inner child let you throw away one of those items without peeking inside? Probably not. And your audience will be just as intrigued. People look exactly the same on paper. Same age, household income, educational level…perhaps they even live in the same neighborhood. But this is just a small part of the picture. The truth is that every person you market to has their own interests, opinions, experiences, and more. Each person is different. This poses the question: What motivates your potential students, patients, or customers to make a decision to invest time, money, and energy into you? View the Feature Project Infographic. The PCI Open House we had in May was a huge success, and part of that success was due to excitement and curiosity created by the invitation we sent out to select recipients. Using our new ESKO digital die-cutter and new variable data technology, we created a buzz in the area, and people were excited to learn how we created our invitation. 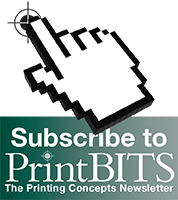 Thank you for reading The Go Dimensional Edition of PrintBITS: The Printing Concepts Newsletter. We appreciate your interest in direct mail marketing and print production, and we would like to hear from you. If you would like to read more about a certain topic or have an interest in a specific article, please contact us at 814-833-8080.